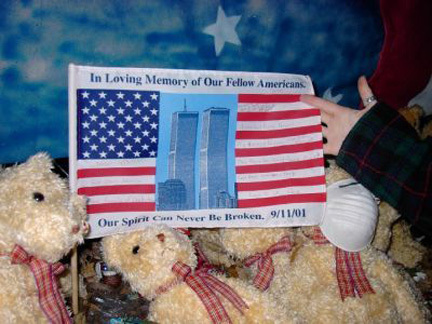 Continuing MBE's special 11 Days of September memorial post series, this story focuses on the origins of songs and music, such as Twin Towers Song for America, that were inspired by the events of September 11, 2001. Back stories are provided, along with links so you will be able to learn more as well as hear some of the greatest music written to commemorate this historical event and the upcoming 10th anniversary. Included are my personal picks for the most emotionally moving tunes that helped me and countless other Americans move forward with hope and a sense of renewal following this tragedy, through the days, months, and years after that horrific 9/11 attack on U.S. soil. This tune -- created by Holt just hours after the World Trade Center collapsed -- is widely thought to be the first of September 11th songs ever to be written and recorded. A number of songs from this album were written and performed in memory of the events of September 11th. These include the title track, The Rising, Empty Sky, You're Missing, and others. Former Beatles member Paul was in a plane on the ground on the morning of September 11th at JFK Airport when the World Trade Center was attacked. So he saw the horrors live as they unfolded in New York. The events of that unforgettable day hit him hard, so he wrote this song the next day. This female musician not only wrote this song but also responded to the 9/11 tragedy by establishing the non-profit Feel the Music, an organization that was founded to bring music and inspiration to children, families and adults touched by trauma, loss or illness. Listen to Valerie's performance of her original memorial song, as she sings it at WTC Responder Day in 2010. This song written by Don Henley and Glenn Frey was recorded in memory of September 11. It featured on the 2003 compilation album The Very Best of Eagles as well as appearing as a bonus track on the Deluxe Edition of the Eagles' 2007 album Long Road Out of Eden. Melissa dedicated this song to the memory of Mark Bingham who died at the age of 31 aboard United Airlines Flight 93 on September 11th. The tune also is her tribute to Mark's family and friends and to all heroes involved. Written by the late singer, Michael had just finished two sold-out performances in New York on September 7 and 10. The next morning, planes crashed into each of the World Trade Center towers, as well as The Pentagon, and a field in Shanksville, PA. Michael rewrote his song and performed it in memory of September 11 with a supergroup of well-known artists that included Celine Dion, Usher, Beyonce, Mariah Carey, Justin Timberlake, Carlos Santana, and many others. For this song, writer performer Neil was inspired by passenger Todd Beamer's last words "Let's roll" aboard hijacked Flight 93 which crashed into a field in Western Pennsylvania. This 9/11 tribute song was included in his album Are You Passionate? Sunday, September 11, 2011 – 10th Anniversary is Marked in Cities & Towns Across U.S.
What songs do you like best that either memorialize the events of September 11th or that you think are the ideal tributes for the 10th Anniversary? Please share and leave a comment below. FTC Disclosure: I did not receive any payment or other compensation associated with this post. See complete FTC Disclosure information that appears at the bottom of MommyBlogExpert's main page and at the bottom of every individual post on this blog, including this one.